it’s fall time. cold and cloudy on some days. sunny and crisp on others. As the last eggplant and tomatoes fall from their respective vines and hit the ground with a soft thud, i look to the heartier crops to feed fresh to my family in the colder darker months. While the acorn and butternut patch produced less than expected, my last hope for homegrown fall fresh sits in a weedy 4×12 raised bed: kale. Set in the ground in July as babies, they are now all grown up and ready to come to the kitchen. In tasting kale salad for the first time some years back, it was love at first bite. And when we started growing it at home, it turned into the “you complete me” kind of love. We were food growing neophytes then and kale was so prolific that we felt like successful gardeners while also reaping the edible rewards regularly. While store bought can be tough on the teeth at times, homegrown was the perfect combination of tender with a bite. And while there is cliche attached to the curly kind (garnish from the 70’s? ), that is what we grew and what we loved. Kale is perfectly suitable for stews and stir fries, yet when in salads, it rocks my salad world and takes me into new salad galaxies. The kale salad on my plate this week comes out perfectly satisfying every time. This is more of a “cooking by looking” recipe and uses surprisingly few stems to fill the salad bowl. 5 kale leaves, torn from the stems (about 2 cups and fills up a single bowl). Drizzle oil, lemon or vinegar and salt and pepper. Top with sunflower seeds and mozzarella and toss together. a hunk of bread seals the deal. If you are sharing and need a bigger salad bowl, use more of each ingredient. 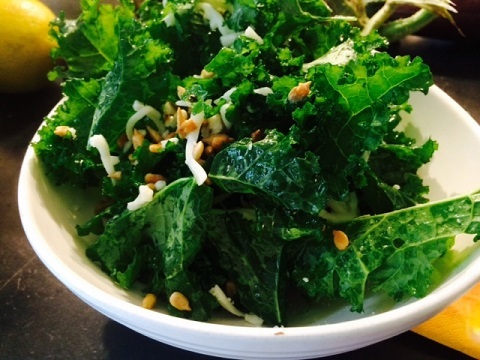 Robust kale wilts slightly when dressed, is emboldened when joined with an acid, and is fortified with additions of crunchy or chewy fruit, grains and proteins. Perfect. Meal. Salad. 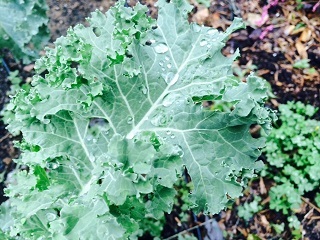 So this fall, i wish for you all to fall for kale- and for a kale romance to grow in your garden and/or on your plates. May your eating be happy and your hearts be fresh.